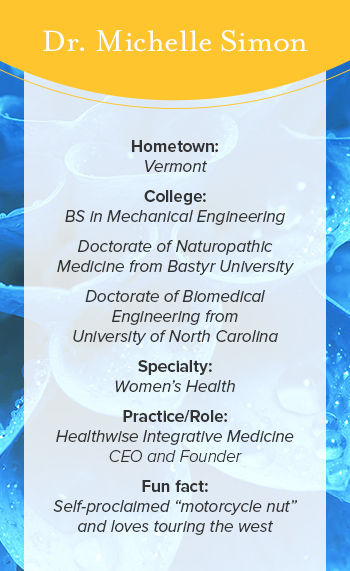 Dr. Michelle Simon graduated from Bastyr University with a doctorate in Naturopathic Medicine and has been practicing since 2002. She also holds a PhD in Biomedical Engineering from the University of North Carolina at Chapel Hill. She is heavily involved in many advocacy organizations, including the Institute for Natural Medicine, a philanthropic organization building for the future of natural medicine. Question: Can you tell me about the Institute for Natural Medicine? Dr. Simon: Our mission is to create broad public access to and education about naturopathic medicine. At this time in America, people really need us and they don't yet know who we are. The opportunity for us is to let people know that we exist, who we are, what our principles are, what our foundation is, what our training is, and get that out to the public. Why is it so important to get the message out to the public? People get that healthcare in this country is not working. People understand that. Almost everyone you talk to understands that. What we are presenting is not only changing individual health, but changing community's health and changing the national health by changing the healthcare delivery system. That's the big objective, to really incorporate the principles and practices of our type of medicine into public health. Helping integrate into health care systems and working collaborative with other care providers is not shutting anyone out, but we can add to what's currently being done. What still needs to be done in terms of preventing barriers to accessing care? Funding. We are working on breaking down barriers to funding sources that have never invested in natural medicine before. This is key, as our resources in the industry can only stretch so far. We need to educate foundations outside of our circles on the transformational power of changing how we approach health care. Additionally, getting the word out and helping connect us to grateful patients is always useful. The mission that we have should connect with and inspire everyone in our profession. How did you go from engineer to naturopathic doctor? My undergraduate degree is in Mechanical Engineering. I like to understand how things work, that has always been in my nature. As I went through mechanical engineering school, I realized I was more interested in things that could apply to the body, so I went to graduate school for biomedical engineering. As I went through my program, I learned more about alternative medical approaches, mind-body medicine, nutrients, importance of diet, and more. Approaches that felt, to me, targeted the root problem of the people who were in the hospital. This is the kind of problem focused, solution-oriented approach to healthcare that I had been seeking. It really fit my whole orientation; in a way, naturopathic medicine is a type of engineering. It's problem-oriented medicine. You're involved in a lot of different initiatives. What does a day in the life look like for you? My bread and butter is still my private practice. That's what I do. I've been doing that since I graduated. I am at my practice for three and a half days a week. In my other day and a half, I'm usually working with the Institute for Natural Medicine, that’s the next biggest demand on me. I do a lot of volunteer work, such as working with the Academy for Integrative Health and Medicine (AIHM) as an ambassador of our profession to that organization, serving as Treasurer for the American Association of Naturopathic Physicians (AANP), and helping with loan repayment programs for the State of Washington. The focus of our practice is largely Women's Health, with a lot of motivational interviewing, diet and nutrition counseling, and exercise guidance. But, because I see women, who are the primary caregivers for families, I usually end up seeing other members of the family too.